On behalf of the Hillsborough County Sheriff's Office Honor Guard, we send our deepest sympathies and condolences. R.I.P. Officer Rittner, may God bless you and keep you. May God comfort your family, friends and all our brothers and sisters with the Milwaukee Police Department. May God wrap you in his loving arms and grant your family and friends strength, comfort and peace during this difficult time. we will keep you all in our thoughts and prayers my brother. Please know that you and your service will never be forgotten. Fidelis Ad Mortem my brother as we remain Standing Tall For Those who Have Fallen, we have the watch from here. Thank you for your service. My condolences to your family and to the Milwaukee Police Department. Rest In Peace. On behalf of the Klamath County Sheriff's Office in Klamath Falls Oregon, we send our sincerest sympathy in the recent loss of your Officer, Matthew Rittner, in the line of duty. It is always a huge loss when a fellow officer makes the ultimate sacrifice. His bravery and courage to protect and serve your community has not gone unnoticed. Also we thank Officer Rittner for his service as a United States Marine Corps. Veteran. Thank you for your service, Officer Rittner - both in the US Marine Corps and as a Police Officer. My heart of prayers and love are extended to your family, the police department and all those affected by such a tragic loss. Rest in peace. I pray we will see you again some day. I am shocked and saddened, again, that we have lost another hero. These murdering criminals do not value life. I joined this site after we lost Officer Sean Tuder of the Mobile Police Dept. so I could keep our fallen officers memories alive. May God Bless and keep you sir and bless your precious family. May God Bless your family, friends and coworkers Officer in this time of need. Rest easy brother. Thank you for your service to both our country and your city. Never forgotten. Prayers for your families both blood, blue, and green. Rest in peace and Olav Hashalom Officer Rittner. My heat aches every time one of my brothers gives his life to protect our society. Our prayers are with his families. We at CoverNowfund.org are working to raise funds to help our law enforcement families in their time of need. May God bless. Our hearts ache over the loss of Police Officer Matthew Rittner for his family, coworkers, and friends. The men & women of the Abilene Police Department extend their prayers of comfort, and remain grateful for the service rendered by Officer Rittner to his community and country. We do not lose hope in the midst of sadness and grief. We remain faithful to the calling of service and protection just as Matthew did. Rest in Peace Officer Rittner. May the Lord grant your family, friends and co-workers peace during this difficult time. Thank you for your service and sacrifice. Rest in peace Officer Rittner! Eternal rest grant to him O Lord. May his soul and the souls of all of the faithfully departed rest in peace. Amen May God bless his family with peace and comfort. Matt, you have served well and will always be remembered for the hero you were. I am honored to have worked with you. May you rest in peace... we have the watch. Rest easy Brother. Thank you for your service. You won’t be forgotten. Deepest Condolences to the Ritter Family. Semper Fi! Semper Fidelis Marine. Our loss is Heaven’s gain. Our Blue Line is further dented but unbroken. In the lore of the Corps you shall live forever. As a Corpsman and a cop I am doubly saddened by you death. 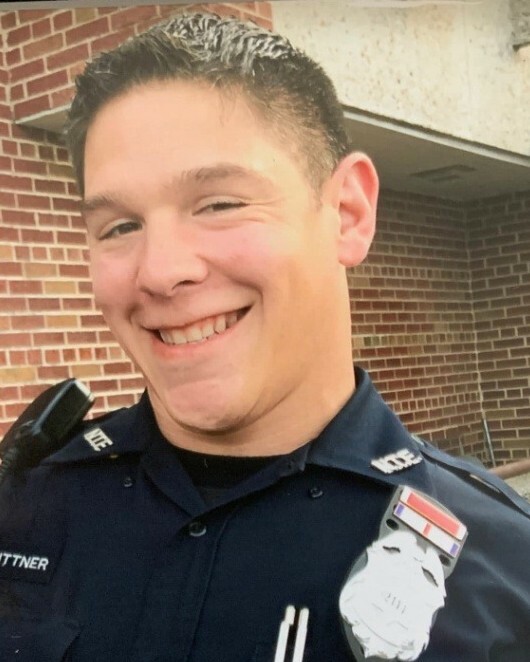 Officer Matthew Rittner will be remembered for his sacrifice. May God bless his memory to his wife, his family, and his community.